September 29th – Last Membership Meeting, Club Ride and Club Cookout. Membership Meeting starting at 10:00 am at Mulligan’s Sport Bar & Grill on Hwy 32 Lakewood. Club Ride and Lunch at 11:00 am over to Crooked Lake for Dusty Trails and Crooked Trails end of the year Poker Run. Club Cookout upon return at the Lakewood Trailhead Park. *The Board of Director’s meet the 2nd Wednesday of the Month at 6:00 pm from March – October at Animal’s Bear Trail Inn. All members are welcome!!! For other club info, contact our club at hiddenbeartrailatvclub@centurytel.net. Headline: Hidden Bear Trail ATV Club and Red Arrow Snowmobile ATV Club graduate 28 ATV Safety Course Students. held at the Lakewood Community Center/Fire Station on April 28th and 29th. 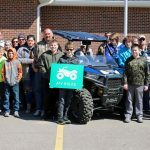 The Hidden Bear Trail ATV Club and Red Arrow Snowmobile ATV Club held a DNR ATV Safety Course on April 28th and 29th. The event was held at the Lakewood Community Center/Fire Station, and attracted students of all ages. Lead Instructor was Brian Fitzpatrick. Instructors Diane Fitzpatrick, Jim Wisneski, Larry Westphal, and John Brantmeier led the two day course, and were extremely pleased with the attentiveness and participation of the students. Department of Natural Resources Lieutenant Conservation Warden Andy Lundin provided insight into relevant information as identified in the Wisconsin Off-Highway Vehicle Regulations. 28 students passed the exam and have successfully the completed the DNR ATV Safety Course. Class participants included: Braden Allen, Bailey Amador, Ronald Amador, Britney Anderson, Gatlin Bohl, Maverick Cole, Denise Davis, Tyler Davis, Paige Frank, Rebecka Heyrman, Donovan Horkan, Shelly Howen, Gracie Howen, Joel Lavarda, Gage Liptack, Maxwell Maigatter, Haylee Paradies, Dennis Pommering, Trentin Ponton, Taylor Rich, Cody Schrank, Jessie Schrank, Nathan Schraven, David Schraven, Corey Sigel, Thomas Van Thiel, Kayle, Vossekuil. And Lawton Webb. Individuals born after January 1, 1988 must complete the course to drive an ATV legally in Wisconsin. Currently that means that anyone 30 years old or younger must have completed the course. An on-line version is available through the DNR, but younger students are highly encouraged to take the classroom version for maximum effect. Instructors stressed the requirement that everyone under the age of 18 must wear a helmet when riding on public trails, including all passengers in a UTV. Congratulations to all the graduates and their parents who encouraged them to take the course. The Hidden Bear Trail ATV Club is active in the communities of Doty, Riverview, and Lakewood. The Red Arrow Snowmobile ATV Club has been serving the Townsend area since 1968.